You've found the “U.S. Columbia Sheep Breeders” page here at Hobby Farm Wisdom! If this is the first time you have visited our site: Welcome! 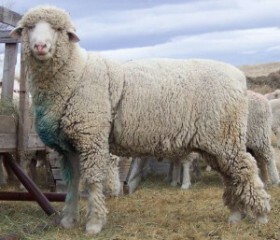 The Columbia breed of sheep is the first to originate in the United States dubbing them an All-American breed. They are a product of Lincoln and Rambouillet crosses with the intent to create a breed that could produce more wool and more lambs to replace the need for crossbreeding. This breed is popular all across the U.S. and is frequently used to sire market lambs. It’s a large sized breed with rams weighing between 225-300 lbs and ewes between 150-225 lbs. They produce a heavy, medium-wool fleece that varies between 31.0 to 24.0 microns. Columbia sheep are also hardy and produce fast growing lambs. These sheep are mostly used for meat and wool production.